Other causes include sand, gravel, and greasy or tar- related materials. A lot of sand, gravel, or just plain mud reveals a broken or loose sewer joint or pipe. Explosions in sewers are not uncommon and should be guarded against. Check with your local safety office for the most current regulations and information. Systematic inspection and maintenance permit early correction of faults before major defects and failures develop. Trouble calls concerning stoppages or slow drainage are received occasionally. The first step in correcting the trouble is to determine the cause. A sewer line can be inspected from manhole to manhole by using a flashlight or a reflecting mirror or both. One person acting as an observer can look up the sewer line toward the flashlight held by the second person in a preceding manhole. Thus the condition of the line can be noted to determine whether roots or other obstructions need cleaning out. Before entering a manhole, ensure the air is safe. You are NOT permitted to enter a manhole until you have an entry permit, identifying all of the conditions that must be satisfied before the entry begins. Additionally, an attendant person shall be stationed outside the manhole at all times. The attendants sole responsibility will be for observation of the entrants into the manhole. The attendant shall have no other responsibilities or duties during the observation. For more information on entering confined spaces, refer to EM 385-1-1, Safety and Health Requirements Manual. Purging or a fresh air pump may be required. Sewage gases are very toxic as well as explosive. Routine sewer maintenance includes flushing, cleaning, and immediate repair of defective sewers. Information pertaining to flushing, cleaning, and repairing sewers is given below. Flushing helps remove loose organic solids and sand or grit deposits from sewers. Flushing is not an efficient method of sewer cleaning unless a high velocity can be maintained between manholes on a short run; in other words, you depend on the high velocity for complete scouring action of the sewer. Flushing may be done by a number of methods, two of which are with a fire hose and with a pneumatic ball. When flushing with a fire hose, you need enough fire hose to reach between manholes. When using this method, string a rope or light cable through the sewer with sewer rods if a plain fire nozzle is used. Start at the upper end of the system and draw the flowing nozzle through the sewer. If a self-propelling turbine type of nozzle is used, the rope is not required. Try to use 2 1/2- inch fire hose discarded by the Fire Department. Paint the sewer-flushing hose at the ends with an identifying color (yellow, non-potable water) to prevent use for emergency potable water connections. In pneumatic-ball flushing, inflate a light rubber ball, such as a beach ball or volleyball bladder, to fit snugly in the sewer, and place it in a small canvas or burlap bag with a light rope attached. Place the ball in the sewer, hold the line until the sewage backs up in the manhole, and allow the ball to move to the next manhole. When an obstruction is reached, the pressure pushes the ball against the crown of the sewer, causing a jet at the bottom (fig. 5-47). As much as 4 miles of sewer can be cleaned in 8 hours by this method, and it works for sewers up to 30 inches in diameter. A wooden ball with a diameter of 1 inch less than the sewer can also be used. Where sewage flow is low, the addition of water to the upper manhole may be required. In the sand cup method, a sand cup with an auger is attached to flexible steel sewer rods to run through the sewer (fig. 5-48). The rubber cup is perforated to provide flushing action. Figure 5-47. 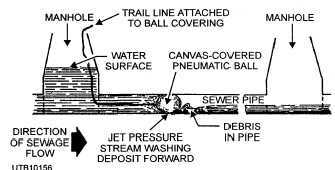 - Ball method of sewer flushing.